Offering you a complete choice of products which include fast setting compound, liquid tiles adhesive and fixing tiles. Matching up to the diverse needs of the patrons, we provide our patrons with the premium quality of Fast Setting Compound. Processed by using latest machinery, the Fast Setting Compound is known for its excellent bonding capacity and enhanced shelf life. Their rich attributes such as water proofing property makes the fast setting compounds highly demanded. Counted as first among the best, we provide patrons with the superior quality of Liquid Tiles Adhesive. Quick drying, high bonding strength and ability to withstand adverse weathering conditions, make the Liquid Tiles Adhesive highly demanded in the market. 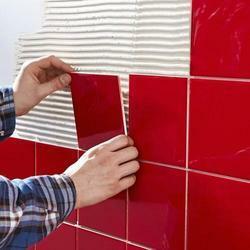 For the purpose of fixing of tiles in various applications, the Liquid Tiles Adhesive are used. We have established ourselves as a trustworthy organization, engaged in manufacturing and wholesaling a precisely formulated array of Fixing Tiles. All our products are ensured for their unparalleled quality as these are processed using advanced techniques and that too in tandem with set industry guidelines. The products which we offer are acknowledged by the clients for their purity, accurate composition, precise pH content, effectiveness and longer shelf life.